The median nerve runs through the carpal tunnel, a canal in the wrist that is surrounded by bone on three sides, and a fibrous sheath (the flexor retinaculum) on the other. In addition to the nerve, many of the hand's tendons pass through this canal. The median nerve is usually compressed by swelling of the contents of the canal. Other causes include soft tissue swelling in and around the tunnel or even by direct pressure from part of a broken or dislocated bone. However, bone dislocations are a rare cause of carpal tunnel syndrome that are a result of severe traumatic events. The syndrome is much more common in women than it is in men. It has a peak incidence around age 50 but can occur in any adult. The first symptoms usually appear when trying to sleep. Symptoms range from a burning, tingling numbness in the fingers (especially the thumb and the index and middle fingers) to difficulty gripping, making a fist, or dropping things. Most early sufferers mistakenly blame the tingling numbness on their sleeping position, thinking their hands have had restricted circulation and are "falling asleep". If left untreated the symptoms often progress to intense pain which restricts hand functionality. It is known as a hidden disability, because people can do some things with their hands and appear to have normal hand function, but often live with severely restricted hand activity due to the pain. Important: unless you have numbness as one of your predominant symptoms, it is unlikely your symptoms are primarily caused by carpal tunnel syndrome. In effect, pain of any type, location, or severity with the absence of significant numbness is not likely carpal tunnel syndrome. 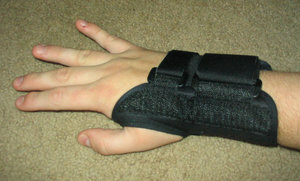 Some cases of carpal tunnel syndrome are due to work-related cumulative trauma of the wrist. It is commonly caused by strain placed on the hand, for instance gripping and typing, which are usually performed repetitively in a person's occupation. The condition was first diagnosed in Australia in the 1980s when musicians started to use synthesizers heavily and people using these instruments started to get hand and wrist pain. The condition went mostly undiagnosed in the US until the mid 1990s when computers became more popular in the workplace. Repetitive stress induced carpal tunnel strain is the leading cause of carpal tunnel syndrome in most industrialized countries. In the USA for instance, repetitive stress induced carpal tunnel syndrome is the biggest single contributing factor to lost time at work. This type of carpal tunnel syndrome results in billions of dollars of workers compensation claims every year.